Narrative: Simon Peter Gillis (April 6, 1875 – January 14, 1964) native of Margaree; attended St F X College; became a policeman with the New York force; was a member of the New York Athletic Club; is given on another page, represented ST F X at the Maritime held at Halifax last September. Mr Gillis easily broke the Maritime record in the 16 lb. hammer, throwing it over 133 feet. He could have easily thrown much further, if the ring from which he threw was a good one. At the Jubilee sports held here a day or two before then, he threw the 16 lb., hammer 160 feet. On the same day he broke the world's record for the 12 lb. hammer, sending it 193 ft. 6 in. 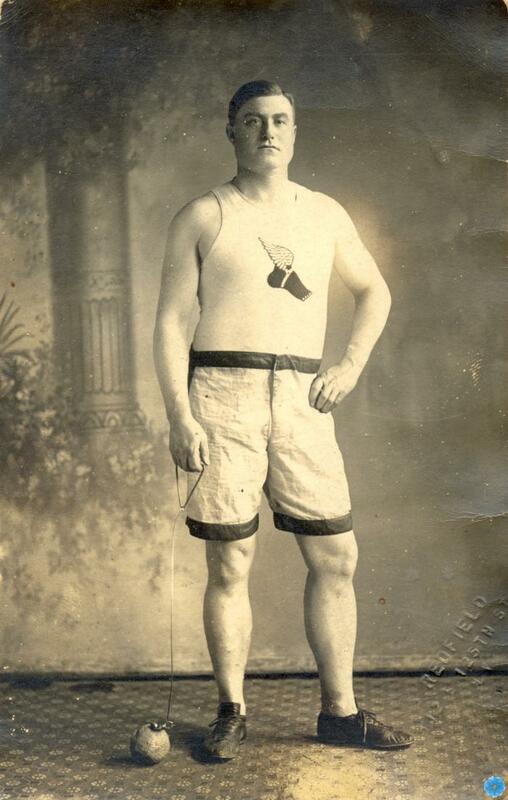 Mr Gillis is a beautiful specimen of humanity, and his great prowess as an athlete is equalled only by his modesty as a man."